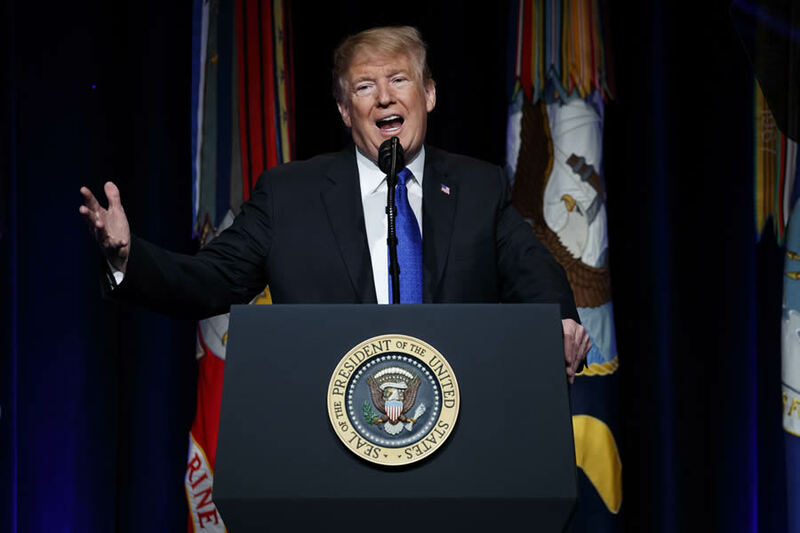 President Donald Trump speaks about American missile defense doctrine, Thursday, Jan. 17, 2019, at the Pentagon. It is amusing that House Speaker Nancy Pelosi claims her desire to delay the State of the Union address is because of security concerns stemming from federal employees’ being furloughed over a budget battle caused by her party’s refusal to secure this country’s southern border. Everyone knows this has nothing to do with security at the Capitol and everything to do with flexing her muscles against President Trump and showing him who’s boss. She also wants to deprive Trump of his bully pulpit during a time when public opinion is tilting away from her party’s unreasonable, bad-faith and dishonest position in this Democrat-caused government shutdown. Like many others, I’d love to see this quasi-monarchical and wholly bogus practice of delivering a speech in lieu of a written report to Congress abandoned forever. But who actually believes that Democrats would ever forgo an opportunity for their president to propagandize to the nation? Knowing this practice will never end, why should Trump unilaterally forfeit another opportunity to, among other things, plead his case for border security to the American people? Whether or not he marches over to Pelosi’s turf to deliver his speech to Congress, he should make a televised speech from whatever venue he chooses and there highlight his impressive achievements in office in summary fashion — not the protracted way that has come to characterize these boring addresses — and then immediately pivot to the border security issue. This time, however, Trump should use all the tools at his disposal to make a simple but striking presentation about the magnitude of the border crisis and the urgency of building a wall. He should play a video montage of Democrats pontificating on border security and juxtapose it against the Democrats’ more recent policies and statements outright opposing border security. He should spend a few important minutes to give a PowerPoint presentation that refutes, point by point, the Democrats’ specious arguments against a border wall and exposes Dems as deliberately extending the shutdown rather than working to resolve it by agreeing to a modest expenditure on border security measures they’ve previously agreed to many times over. He should forcefully demonstrate that the Democrats are consciously undermining American sovereignty and placing the interests of people here illegally ahead of those of American citizens. He must show that these cynical politicians are engaged in a sordid game of political power and that their depiction of him as a partisan is just more projection — accusing him of that which they are doing. They wrote the book on partisanship, and if you need a reminder, just review their partisan cram-down of Obamacare and their obscene celebration of its passage without a single Republican vote. If you need a more enduring wake-up call, just consider how leftists today routinely slam almost all conservatives and Republicans as mean-spirited, racist and sexist just by virtue of their political ideology and affiliation. That’s neither the language nor the spirit of bipartisanship — and in fact renders meaningful bipartisanship nearly impossible. If you really believe that Pelosi, Senate Minority Leader Chuck Schumer, the rest of the Democratic leadership and the entirety of the liberal media are standing on principle in this shutdown battle — as opposed to trying to humiliate and emasculate President Trump — you should quickly surf the web and see for yourself. If any Republican congressional leader had similarly rebuffed President Obama — disinviting him to speak before Congress in his State of the Union speech — he or she would have been savaged as a disrespectful, partisan monster, not to mention a racist. Democrats are playing a dangerous game with our national security, and they must be called to account — and stopped in their tracks. It’s time for President Trump to level the playing field against the monolithic liberal media and marshal the resources available to him, including his formidable media savvy, and make an even stronger case for national security to the American people.